KISS will begin on The End of the Road in 2019 and remain on tour for three years, finally reaching the twilight of their career. Though [original guitarist Ace] Frehley hasn’t been a member of KISS since 2002, his enormous contributions to the band haven’t faded with fans, as they’re constantly demanding a reunion. Watch Loudwire‘s interview with Ace Frehley below. 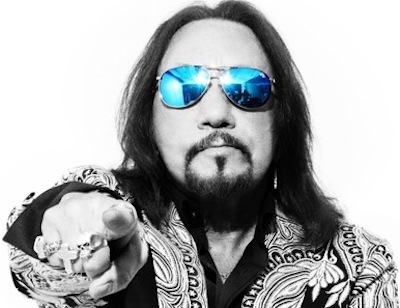 To purchase Frehley’s new album, Spaceman, please click here. Goodness, this business about lip synching’s got me really concerned; it’s a Kiss axiom that their show is 100% live even if there’s a hidden keyboard player, it’s live. I would have no problem with Eric Singer doubling Paul now…that was always a strength of Kiss’s, that they had four vocalists who could cover each other…why should that be any different now? Ace’s guitar is the Kiss sound…I saw him solo on his Space Invaders tour and he plays with so much force and his guitar sounded exactly like it does on Kiss Alive! it actually caused this chemical reaction in my brain. The more I think about it the more I like it; Paul could put more into his guitar playing …he could save his voice in the show for the “featured” parts of the songs….Eric sings great…I think they should go with this and having Ace’s guitar would also lessen the impact of having someone else singing Paul’s songs (with Paul) on the overall Kissness of the show. Live Eric is better than Milli Vanilli Paul….however, just goes to show you Kiss should have called it quits years ago. They have no one to blame for themselves. If Kiss decides to use prerecorded vocals, it will be a slap in the face to the fans who have supported this group through thick and thin.